LaunchBar 5 Beta at http://www.obdev.at for free (beta) from Leo Laporte. MacUpdate Holiday Bundle at http://www.mupromo.com forÃ?â? ?Ã?Â $49.99 from Leo Laporte. Google Sketch Up at http://sketchup.google.com/ for free from Alex Lindsay. Google Sketch Up Pro at http://sketchup.google.com/ for $495 from Alex Lindsay. GenuineFractals 6 at http://www.ononesoftware.com for $159.95 from Scott Bourne. 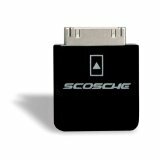 Scosche Charging Adapter for iPod Touch, iPod Nano, and iPhone 3G (Black) for $29.99 from Andy Ihnatko. Anansi Boys: A Novel (P.S.) from Leo Laporte. Live From New York: An Uncensored History of Saturday Night Live, as Told By Its Stars, Writers and Guests from Andy Ihnatko. The Spartans: The World of the Warrior-Heroes of Ancient Greece from Scott Bourne. Born Standing Up: A Comic’s Life from Andy Ihnatko. Outliers: The Story of Success from Alex Lindsay. Will any of the MacWorld Expo presentations from you guys be available to download?